A company hoping to build luxury homes on the Quartett Club property faces blowback from residents, councilman. It was presented as a choice between 31 or 44 luxury homes. Either way, judging by the discussion at the Somerton Civic Association’s April meeting, the Philadelphia Quartett Club property was being developed. The only question was whether the club’s building, which may be among the oldest in the neighborhood, would be saved. Then, a couple of days later, Tenth District Councilman Brian O’Neill made an announcement — he would not be supporting any proposal to build houses on the site. O’Neill’s approval is integral to the project because the developer needs a bill passed by City Council to strike two paper streets and add new public roads. Talk at the Somerton meeting indicated O’Neill supported the 44-home plan, which would involve the demolition of the clubhouse. 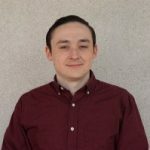 However, in an interview with the Northeast Times, the councilman said he has never pushed for the development of the 18.5-acre Quartett Club property at 1075 Southampton Road. “That has never, ever been the case,” said O’Neill, adding that he has talked to developers interested in the site over the past six years. O’Neill said his announcement was in response to the reaction by residents at the civic association meeting. A poll was taken, and only two neighbors expressed support for the 44-home proposal. More than 50 voted for the 31-lot design, but many did not vote and argued there should have been a third option for no housing at all on the Quartett Club land, which includes two parcels. The 31-home plan would keep the Quartett Club building, and the development would be built on the property’s golf course and swim club, neither of which are currently in use. O’Neill said there never should have been two options. He said he has consistently opposed any plan that would leave the area “stuck” with the clubhouse, which he said could be used for any number of businesses in the future. “They would never allow a catering business to go in there today in the middle of a residential neighborhood,” O’Neill said. It’s unclear where the project stands without O’Neill’s support. Vincent DeLuca said at the civic meeting that his company, DeLuca Homes, has an agreement to buy the Quartett Club land from Milillo Event Group, which operates a catering business there. Neither DeLuca nor Milillo, formerly known as P&P Caterers, could be reached for comment following O’Neill’s announcement on Thursday. At the meeting, Ed Milillo, co-owner of the catering company, said he would like to continue operating out of the building. However, he indicated that the taxes on the former golf course and swim club are a burden on his business. The parcel with the open space is assessed at more than $1.5 million, according to city property records. As for DeLuca Homes, it is permitted “by right” to build homes on the property because it is zoned residential. However, the company would need O’Neill’s approval for the streets. 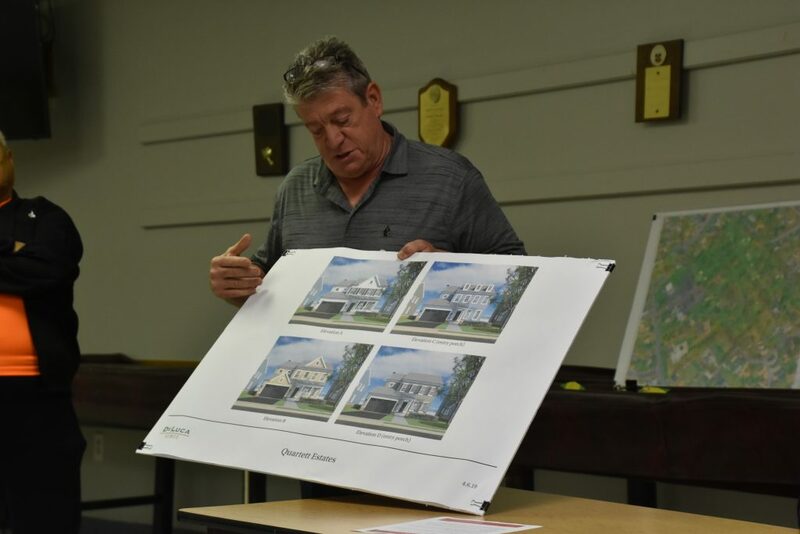 During a presentation, Vincent DeLuca said he was looking to build four-bedroom single-family homes with two-car garages. The average lot size would be 14,000 square feet, and each home would range from 2,500 to 3,200 square feet. He said it didn’t matter to him whether residents preferred the 44 or 31 lot design. “We received some feedback that the commercial use was supposed to be eliminated and not be there, so we revised our agreement with the owners to acquire both properties,” DeLuca said. A large crowd of residents attended the meeting, and a good portion weren’t thrilled with either plan. The civic association had just finished a discussion about overdevelopment, and some viewed the proposal as another project that would eliminate open space in the neighborhood. Others expressed concerns about whether the additional residents would strain the area’s streets and fire protection coverage. Anxiety about the future of the Quartett Club building also flowed through the conversation. 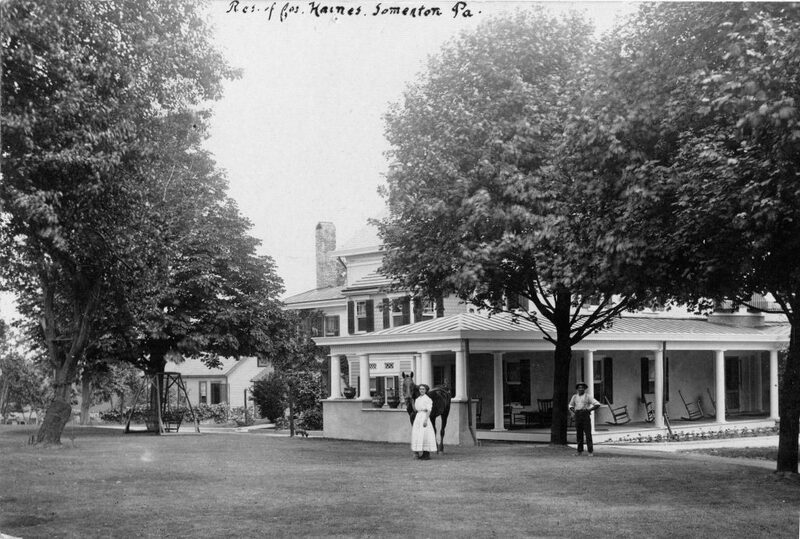 Some believe a small part of the clubhouse dates to the 1740s. Local historian Fred Moore and Somerton Civic Association President Chris Bordelon have researched the history of the property. Moore, who also spoke at the meeting, told the Times that it’s possible that the oldest portion of the property served as a parsonage for the pastor of two nearby branches of the Dutch Reformed Church between 1744 and 1775. The evidence is not completely conclusive, Moore said. There have been significant alterations and additions to the clubhouse, he added. However, it appears to look very much now as it did in the early 1900s, when it served as a residence for textile merchant Joseph Haines and his family. Moore, who serves as treasurer of Friends of Northeast History, said he hopes the building is not demolished. It currently is not on any historic registers.